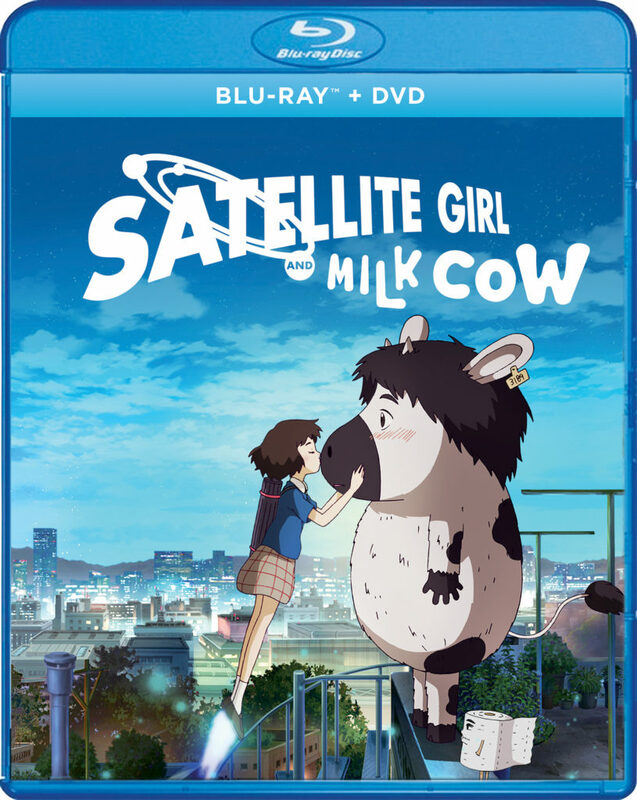 In Satellite Girl an Milk Cow, it all starts when an out of commission satellite picks up a lovelorn ballad on her radio antenna and descends to Earth to find the source of such sincere emotions. GKIDS and Shout! Factory have announced the release of the charming fantasy/science fiction romance Satellite Girl and Milk Cow on Blu-ray/DVD on June 5, 2018. The debut feature-length film from Korean director Chang Hyung-yun, acclaimed creator of animated short films that have premiered and won prizes at festivals worldwide, the highly original Satellite Girl and Milk Cow was produced by Cho Young-kag (The Fake, The King of Pigs), and received an Asia-Pacific Screen Award nomination for Best Animated Feature. An out of commission satellite picks up a lovelorn ballad on her radio antenna and descends to Earth to find the source of such sincere emotions. But on the way she is caught in a raging magical battle and transforms into Satellite Girl, complete with rocket shoes and weapon-firing limbs. Meanwhile, the balladeer in question – a loser twentysomething at a café open mic – meets the fate that befalls all broken-hearted lovers: he is turned into a farm animal. But love knows no bounds, and aided by the wise and powerful Merlin – a wizard who has been turned into a roll of toilet paper – our duo must evade the all-consuming incinerator monster, the wily pig witch, and other nefarious adversaries in an attempt to be together. In this cute and funny DVD, we have a heart-broken musician, an enchanted toilet paper roll and a satellite turned into a girl. Caught your attention yet?! I hope so! This extremely unique movie will leave you laughing and wanting more. Our heart-broken musician is turned into a cow – yup a cow – and his beautiful music attracts the attention of a satellite. As the satellite moves closer to the music, she is turned into Satellite Girl AND she has rocket shoes and limbs that can turn into weapons. Add in an enchanted toilet paper and these three new friends are off to great adventures that you will not want to miss. This is a unique and special movie right from the get go. We loved the plot and the animations are fantastic. This is a great movie for older children and their families. Anime is new to me to. I have heard my nieces talk about it and that is why I want to win it! It’d be new to me too but I think it’s something my daughter and I can watch together and I would love to see it! Just watched this one tonight. It is wonderful and weird! My teens love this type of thing so it gives me a chance to bond with them. I like the rocket shoes and this appeals to me.I like that this movie is a fantasy/science fiction romance. My daughter would love to see this movie. Looks fun.